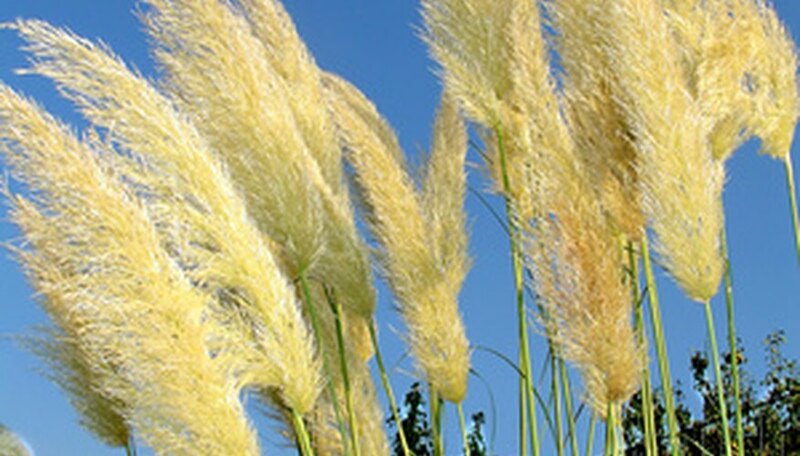 Pampas grass (Cortaderia selloana) is an ornamental grass growing in a cluster with a long flowering blade shooting from the center. The long stem is feathering in appearance and stores seeds that are released when the perennial goes into the dormancy period. Uncut Pampas grass clusters grow over 6 feet tall. While traditionally grown outdoors for privacy or central focal point of a landscape design, frequently trimmed Pampas grass can grow in containers for patios, decks or indoors. Line the bottom of a 10-gallon potting container with small pebbles or rocks to provide additional drainage for the Pampas grass. Fill the container 3/4 full with potting soil. Rake the surface with a fork. Scatter a small handful of Pampas grass seeds in the center of the container. Cover with 1/4-inch of dirt. Water until the surface is moist but not wet. Place the container in a south-facing window. Use a regular spray bottle to lightly mist the soil daily until the seeds germinate. Water the seedlings weekly, once they have sprouted. Allow seedlings to reach approximately 24 inches prior to trimming. Trim the Pampas grass as needed to control height for the container location. Place containers outdoor to create a privacy barrier for patios or a focal point for a deck. Pampas grass blades are notorious for their sharp edges. Wear gardening gloves while trimming.